Happy Birthday to Brock Pierce from FortyThree PR and the Swytch team! The winners of the 2018 BlockAwards have been announced and among them are three of our clients! 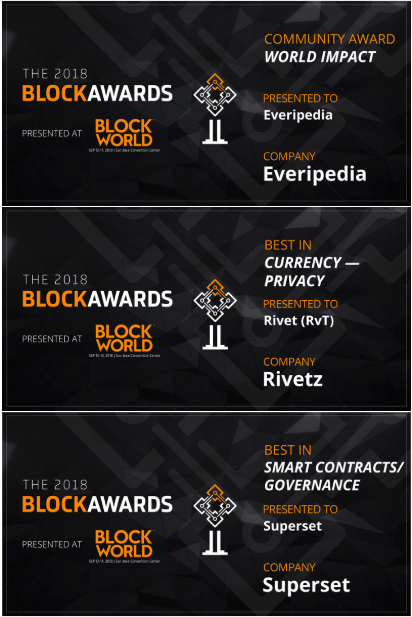 Everipedia, Rivetz and Superset were each honored with a BlockAward in a different category. The BlockAwards celebrate technical innovation, adoption and reception in the Blockchain Industry and received hundreds of nominations. BlockAward winners were selected based on three criteria: attraction of attention and awareness, generally positive regard by the developer/engineering community and sector leadership for innovation. Everipedia was recognized with “Community Award - World Impact” for its application of blockchain technology in increasing accessibility to knowledge and creating a network that is essentially impervious to government censorship attempts globally. Rivetz was honored with “Best in Currency - Privacy” for its powerful device-centric security paradigm that evolves the industry past today’s username/password model. Superset received “Best in Smart Contracts/Governance” for allowing organizations to automate processes through smart contracts, quickly, easily and inexpensively using artificial intelligence and blockchain technology. The BlockAward ceremony will take place during BlockWorld 2018, the world’s largest Blockchain Developer conference & expo boasting over 3,000 attendees. Exciting news for our client, Everipedia! A group of strategic investors led by Galaxy Digital’s EOS.IO Ecosystem Fund invested $30M in Everipedia, supporting the world’s first blockchain encyclopedia to launch their new decentralized, peer-to-peer knowledge network. The investment will also enable Everipedia to rapidly scale its community. This announcement garnered coverage in top-tier publications such as Business Insider, Fortune and Reuters. The news was trending on TechMeme in a matter of hours and was included in various newsletters from outlets including Business Insider and Fortune the following morning. We are delighted to see growing interest in Everipedia’s noble and innovative mission, and look forward to the next phase of disrupting the traditional knowledge economy with blockchain. When knowledge is power, it’s incredibly important to ensure everyone can access factual, trustworthy information. This month, we worked on an exciting announcement from our newest client, Everipedia, a company purpose-built to decentralize the world’s knowledge. With over six million articles, Everipedia is the largest English encyclopedia and the company has now set its sights on becoming the very first encyclopedia on the blockchain. Everipedia’s noble mission of creating a more modern and inclusive version of Wikipedia actually attracted Wikipedia’s co-founder, Dr. Larry Sanger -- he is now Everipedia’s Chief Information Officer. Check out the Everipedia page about FortyThree PR. The 2017 Virtual Reality Strategy Conference did not disappoint, with almost 500 guests from around the world in attendance. This October, the conference took place at the Hilton in San Francisco’s financial district, welcoming 85 featured speakers to give their insights on virtual and augmented reality. The goal of the event is not only to educate attendees about the capabilities and potential applications of VR and AR, but to expose them to companies that are currently using the technology to expand the reach of their businesses, and provide access to vendors who can make the tools and software a reality for everyone who attends. The diverse community of both speakers and guests created invaluable networking opportunities with tech and business insiders from around the world. At FortyThree, we were lucky to be a sponsor for this amazing event, and we had a blast as one of their media managers. The most exciting part about the event was seeing all the potential for growth that virtual and augmented reality has in store for 2018. There were tons of workshops and prototype testing stations where guests could try out some of the new AR and VR products before they hit the market. As impressive as the new technology displays were, we were even more blown away by the number of guests. There was hardly room to stand, but it was great to see the overwhelming enthusiasm for everything VRS had to offer. We were also thrilled to hear from so many speakers with such diverse backgrounds, like Clifton Dawson, CEO of Greenlight Insights, Rikard Steiber, President of Viveport and SVP at HTC, and Tony Parisi, Global Head of VR and AR at Unity. We left the 2017 VRS conference with new insights, partnerships and most of all enthusiasm about what’s to come in the world of virtual and augmented reality. Despite being one of the most expensive places to live, the Bay Area is also home to thousands of individuals experiencing homelessness. Once people become homeless, it’s nearly impossible to get back on their feet. As a downtown business located on one of Santa Cruz’s busiest streets, we certainly see the impact homelessness has on individuals, businesses and the community at large. This fall we were delighted to support the launch of the Downtown Streets Team in Santa Cruz, a project focused on ending homelessness by restoring dignity and rebuilding the lives of those who are unhoused. Next time you’re in Santa Cruz, give a friendly hello to Downtown Streets Team members (you’ll know them by their yellow shirts). You can learn more about the team here. The old adage that half your advertising budget is being wasted still holds true, but now you know which half is being wasted and you can quickly correct it. We live, work and play online and for marketers this new reality creates enormous challenges and opportunities. Content Marketing: Create useful content for your target audience. This can range from insightful articles, surveys, videos, infographics, how-tos, etc. Once you have the content on your site or better yet published on a media site, then drive potential customers/partners to it. Use Facebook/Instagram for consumers and LinkedIn to target investors, partners and influencers. Free Web Traffic: Very little is more valuable than free traffic resulting in new customers. Some effective strategies are: 1) Automate a free part of your service or product on the web in exchange for contact info; 2) Offer useful stats or a report in exchange for an email; 3) Get an SEO and/or search engine marketing (SEM) expert in and optimize your site for the kind of traffic you want. Automate, Automate, Automate: Almost everything you do in online marketing can be tracked and then sliced and diced. The number of tools is growing every day, but some good ones are Mint, Clicky and of course Google Analytics. These will give you a very clear and real-time picture of what is working and not working. Mobile: Mobile can’t be an afterthought and you are better off with a Mobile First marketing campaign. All your marketing campaigns need to be optimized for smartphones because a lot of times more than half the views will come from phones. We are all in uncharted territory, but these best practices are quickly emerging to separate the winners from the losers. The reward for winners is successfully engaging with new customers in a way that is authentic and mutually beneficial. Click here to sign up for the 43 newsletter. No March Madness is complete without a Cinderella story. This year’s Cinderella story unfolded in the FortyThree office rather than in the actual NCAA tournament. Each team member carefully filled out a bracket and followed along as the tournament progressed. 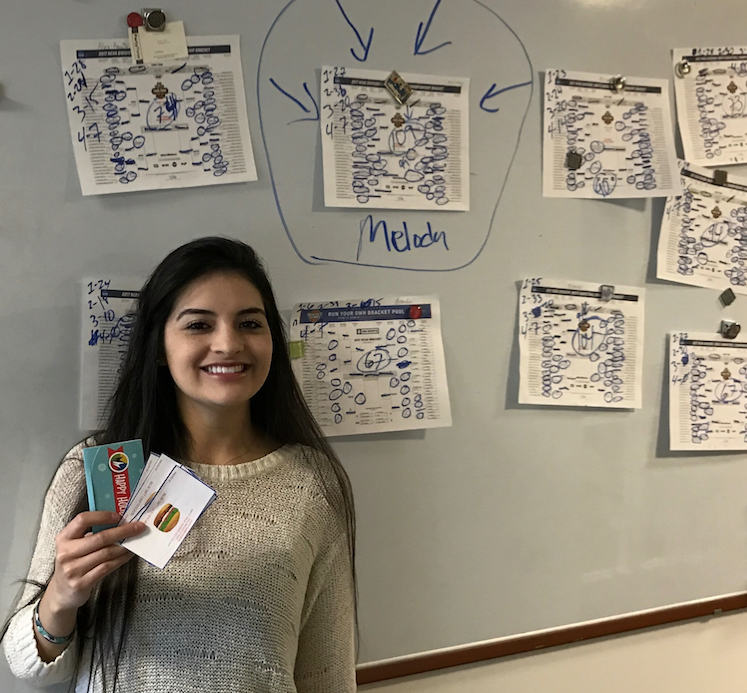 After a few tight games and exciting upsets, a dark horse in the office bracket challenge, Account Assistant Melody came out on top. She will be taking home a gift certificate for Jack’s Hamburgers and the movies. Your source for updates on tech, digital marketing and online outreach!